The recent storms have uprooted some of the trees in the Domaine affording our gardeners the opportunity to run amok with a chainsaw. Or so I thought. It now appears that they may well be honing their skills to qualify for next year’s Timbersports World Championship. A few weeks ago, while idly flicking through the mainstream sports channels, I happened upon the World Timbersports Championships from Austria. I fondly imagined that this was a minority sport: not so. Established in 1985, the STIHL Timbersports World Series assembles the world’s top lumberjack and lumberjill (I kid you not) athletes and it is watched by over 20 million viewers from over 60 countries. They even have a US based collegiate series. Back to a wet Tyrol, where the 16 top athletes from around the globe were competing in a variety of disciplines based on traditional logging skills to determine the best all-around lumberjack in front of a crowd of 4,000 sodden spectators. I just had to watch. Like all top athletes they made it look easy however I was mindful that the slightest slip could lead to something other than wood being severed. Equally, there’s no way I could watch this for hours on end but those sodden spectators, not forgetting 20 million viewers, probably feel the same way about cycling. The competitor uses a customized chain saw to make three precision cuts within a small designated space. Competitors will be disqualified if they saw outside of the designated space or fail to saw a “cookie” (circular piece of sawed wood). Key to this discipline is the reliability of the custom-made saw. U.S. competitor Matt Bush set the hot saw world record in 2003 at 5.085 seconds. Here the competitor cuts through white pine using a single man band saw. 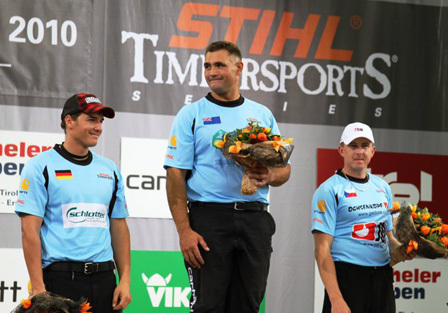 New Zealander and 3-time STIHL® TIMBERSPORTS® Series champion Jason Wynyard set the world record for the single buck at 9.39 seconds in 2007. Using an axe to chop pockets into a 3 metre poplar pole, the competitor then places springboard platforms into the pockets to climb up the pole and chop through a log at the top of the pole. The springboard chop world record is 32.77 seconds set by New Zealander David Bolstad in 2000. Similar to the hot saw; the competitor must cut two cookies from a pine log within a designated space using a power chainsaw. Jason Wynyard set the world record in this discipline at 9.81 seconds at the 2008 finals in Columbus. Standing on a log, the competitor must sever said log with a racing axe making cuts from both sides. This is one of the more dangerous disciplines because the competitor is swinging a razor-sharp axe at approximately 110km/h between his feet. Jason Wynyard set the record for the underhand chop discipline in 2003 at 12.11 seconds. This mimics the skills required to move logs down river. Competitors run down and back across a string of seven logs of different shapes and sizes attached end to end in a 25 metre pool. The competitor with the fastest time advances to the next round. Using spurs, ropes and a harness, competitors race to the top of a 20 metre pole and return to a cushioned crash pad. On the descent, reaching speeds in excess of 20km/h, they must touch the pole with their feet at least once every 6 metres. Again, speed is of the essence. You now know more than you ever wanted to know about Timbersports which may (or may not) come in handy if you’re cornered at the office party by one of the office bores. You now have the ideal weapon with which to strike back and I don’t mean an axe!